Get a piece of the action in this awesome mountain view cabin, View From The Top! We can all agree that there is no better place to find yourself than in a cabin in the North Ga mountains, soaking up some sun, and breathing some fresh air. Make your dreams a reality in this 5-bedroom home which offers plenty of room for you and the whole gang! The fully equipped kitchen is perfect for preparing all and any meals during your retreat. The dining area is adjacent to the kitchen for ultimate convenience. Enjoying mealtime is an enjoyable experience at the gorgeous farmhouse table. The open floor plan means that family time easier than ever. The living room is spacious and offers a Mountain View out of the soaring prow front windows. The real log fireplace is perfect for a nice crackling fire while you cozy up on the couch and watch a movie with your honey. When bedtime rolls around, there are plenty of choices for sleeping, with 5 bedrooms and a loft to choose from! Each of the 3 levels offers a bathroom. Don't forget the lower level offers a room made just for fun! The game room has all of your recreational needs in mind, offering a card table, foosball, table shuffleboard and a flat panel TV. This cabin is easily the best for an ultimate family experience. Located in the Aska Adventure Area close to the Toccoa River, 15 minutes from Downtown Blue Ridge shopping and dining. Master King Bedroom with 42" Flat Panel TV, Balcony, and Attached bathroom with tile shower. Game Room with card table, foosball table, and shuffleboard table. The cabin was perfect for our large family. There was plenty of room and space. We enjoyed the game room/ great room at night after our busy days. we truly had an amazing time and will def be back! This place is very nice and at a great location. You made me feel that you wanted us to come & enjoy what you have to offer. You were always pleasant, friendly & helpful. We'd never had a trip together like this before - we weren't disappointed. Thank you! We had a wonderful time at View From the Top! So much of God's beautiful creation to enjoy. The cabin was very comfortable for our family (consisting of 3 households). We only had 10 so we had space left over. Pet friendly was important to us as well. Our little pup doesn't like to be away from us. Thanks for having such a lovely place for us to enjoy! I've visited many cabins, but never in Georgia. I definitely will be returning and bringing my entire family. We love Sofie!!! She is friendly, caring and helpful! We are repeat guests at Southern Comfort and have always had great experiences! What a beautiful place to spend time with the family! Plenty of room to spread out and so comfortable. It met all our expectations! 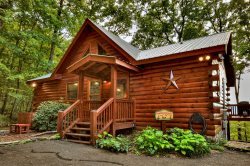 This cabin offered everything we needed: game area downstairs for the older grandchildren, outdoor fireplace, gorgeous views, easily accessible firepit, hot tub on main level, pet friendly and lots of bedrooms! Perfect!!! !